Fast forward to a few months down the road: Jack was still not house trained. Everything was chewed up, including woodwork and the wall to wall carpeting. One night he peed on me as I slept. The worst, though, was when he constantly nipped at my son. I could not leave the room for fear of him injuring my child. It was during this time that my mother, Joey’s beloved grandmother, was diagnosed with 2-60 days to live. I decided that I could not live like this any longer. With what I felt was the only option at the time, taking into account my current circumstances, I brought Jack to the SPCA. It was a heart-wrenching thing to do. After driving around the block for an hour and pleading with Jack to “be good,” I drove to the SPCA. I stood outside as families walked past and complimented me for “adopting the Jack Russell.” There is not a week that goes by that I don’t regret that decision. I felt like a loser because only a scumbag would do that, not someone like me. The guilt I felt was indescribable. The house was quiet when Joey got home; he asked where Jack was…”I sent Jack back to live with his parents and brothers and sisters, back to where Grandma and Grandpa got him from.” Joey hated me, and I resented my husband for being the one who wanted a dog, but then did not spend enough time with Jack to train him. Even worse, he stood back and allowed me to be the bad guy. What a horrible time. On top of my son hating me, I had to do what any “good” daughter would do and leave my home to move in with my mother to care for her. While grieving my mother’s illness, I now had the added stress of crying daily as I phoned the SPCA to check on Jack. I begged them to call me if no one wanted him so I could come and take him back. Finally one day when I called they claimed he had been adopted. Perhaps it was just to get rid of me, because I never did feel a sense of closure. Joey was in good hands with my husband and his other grandparents to pick up the slack. Nevertheless, the first sign of distraught reared its ugly head when six year old Joey said he was having trouble breathing That’s when the emergency rooms and testing began. Ultimately, he was diagnosed with Childhood Asthma and given inhalers, pills, and a breathing treatment machine. One doctor did say that he believed that it was psychosomatic because when he distracted Joey with happy ideas he seemed to breathe fine. It was at this time that I started sleeping in sweat pants and the like, just in case we had to make an emergency trip to the hospital–if I were even home, of course. The next six months proved to be very difficult. While Joey had developed Asthma, I developed Anxieties. It was not long after my mother’s passing that my niece, a member of the 174th fighter wing, was deployed to Iraq. Joey caught things on the news about the war that we tried to keep him away from, and I guess everything that was happening proved too much for little Joey to handle. He starting saving garbage. He was afraid of throwing anything away for fear that he would forget what it looked like. At first it was easy to make compromises; rather than removing his bedroom wallpaper border and throwing it all away, we saved a piece and framed it for him to hang on his bedroom wall. As time went by though, it spun out of control as he could not bear to part with food wrappers or even some food itself. Once there was a french fry incident in the mall; it was then that I knew he needed help, and so did I.
I contacted the school and the psychologist began meeting with Joey, and other children from the elementary school. They played this one game that he enjoyed: “Feelings Candy Land.” If you landed on red, then you would have to describe something that made you mad, and so on. At this same time, I started seeing a psychiartrist, and we both started receiving Hospice services for counseling. Joey also joined a children’s grief group, which I can’t say enough good things about. We were works in progress…but still broken. Something needed to be done immediately, but what? What could I do for Joey? The next day was his seventh birthday and I knew it must be special. As I was scanning the paper, I came across a classified ad for a Golden Retriever; I had been researching dog breeds, and it seemed that a Golden would be a good family dog. I read that they are intelligent and eager to please. Also an article I read on the internet said that Goldens are patient with a gentle demeanor, which would be good for a child. I called the number and set up an appointment to meet the lady and her dog. My God, I thought, how on earth would I be able to take care of a dog when I could barely take care of myself and my son? This isn’t about me, I told myself; this is about Joey. But I also realized that if we were to get another dog, I had to commit to being a caregiver. I knew that dogs are a lot of work. They needed exercise, training, to be let out, fed, given fresh water, taken to the vet, and brushed. My thoughts turned to Jack and I was determined to take on this new venture. I called my husband at work who, of course, knew what a terrible time it had been. I explained to him that I could not take another moment of Joey hating me and that I was going to look into getting a Golden Retriever. After my husband also committed to assisting in the care of another family pet, off I went to meet a dog, the absolute last thing in the world that I wanted to do. Soon walking towards me was an older woman with a very happy, wagging, wiggling dog. She instructed the dog to sit. “Alexis Tranquility is her name,” she said. As I bent down to pet Lexi, as we call her, she raised her paw and put it on me to introduce herself, and that was it for me, ahhh… She explained that her husband was ill and that she could no longer care for Lexi. I could tell that this was a very difficult decision for her. The morning of Joey’s seventh birthday, I took the day off work and told Joey that we had to run an errand at the bank; he didn’t want to go. When we arrived, a woman and a dog came towards us–a beautiful Golden Retriever with ribbons hanging off her collar. A fine birthday present indeed. I said, “Joey don’t you like that dog? Maybe the woman will let you pet her.” Pet her he did. “Wouldn’t it be nice if that were your dog?”I inquired, “Yeeaaa,” replied Joey. “She’s yours. Happy Birthday.” In a whirlwind, the transaction was complete, and this happy, but unfamiliar dog, was in my car along with food, treats, toys, and a huge cage. As I fumbled for the house keys and Joey struggled to hold the leash, Lexi panted and pulled gleefully. “Let me in, let me in,” she seemed to say. I finally managed to open the door and the beautiful Golden Retriever sprang in, leapt up the stairs fiercely wagging her tail, and frantically searched for something to put in her mouth; anything. Must put something in mouth, let me see a container in the recyclables, no, too big, that will not do. Oh wait, what’s this? A pile of clean laundry, yes, yes this will do, a tee shirt, maybe…a towel, yes this will work. There she stood with a towel hanging from her mouth, and her tail wagging back and forth, so much so that the whole second half of her body moved with it, and slam, there went the cherry koolaid that was sitting on the coffee table. Then my husband came in and after settling down somewhat, she sat and properly introduced herself—you guessed it, by putting her paw on my husband. I said ‘Isn’t she sweet? Don’t you like her?” He responded, “Yeah, she’s all right.” (Which in my husband’s terms means yes, very much). I phoned the generous lady who allowed us to purchase Lexi to thank her and assure her that we would take good care of her. I could hear the relief in her voice as she thanked me for calling. Lexi helped heal our anxieties and pain. According to the renowned psychic Sylvia Browne in her book, All Pets go to Heaven, “Animals are here for an example to humans to show us what is found only after here, unconditional Love.” Lexi helped us not only bear the pain, but to thrive in spite of it. Lexi will never lie, cheat or hurt us. What you see is real. You can’t measure love as you do a sack of flour, but you can hug Lexi or look into her eyes and feel one hundred pounds of love. Lexi is Joey’s pal; he seems to empathize with her, you know, against those horrid adults. Lexi has helped Joey develop an outward focus, and not worry so much, because now he is more involved in his surroundings. There is not a single doubt in my mind that Lexi existed before with God and was sent to us, as she was born mere weeks before my mother died, perhaps in anticipation of our upcoming grief. Joey is now eleven, happy and well-adjusted. Knowing Lexi is undisputed proof of true love. Life is kind; my niece, Joey’s cousin, Lt Col. LaLainia Secreti MD USAF came home safe and sound, Joey loves me, and I am now officially a dog and a cat lover. Even notice when others do it wrong. Rejoices whenbever truth wins out. Your ground in defending him. 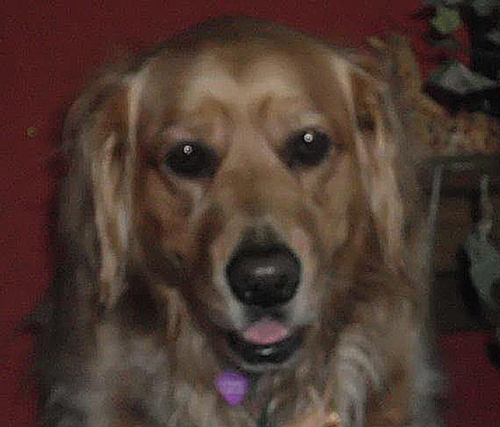 Denise lives in Cicero, New York with her husband Joe, eleven-year old son Joey, their Himalayan cat Sir Bailey and their Golden Retriever Alexis Tranquility (can you tell that the pets rule, we are not worthy to share our home with such “Royalty”). Denise works for a non-profit agency which provides services to individuals with developmental disabilities. She has enjoyed writing since middle school. What a sweet story! I have always loved dogs, and have seen first-hand the amazing connection that special dogs can make with their human families. Your story described this experience very vividly and profoundly. You seem like a wonderful daughter and mother. Thanks for sharing Lexi with us. What a beautiful story! I believe everything happens for a reason. And Lexi was sent just for you. (and Joey). Pets are perfect company for old and young alike. Your story is wonderfully written, please continue to submit stories. A really nice story and well written. I liked it that it wasn’t all sweet, the events and feelings that were difficult were included. Really nice. What an amazing story! I really enjoyed every part of it. What really stood out to me was the true emotions & feelings felt for your mother, your son, your niece and how to make things better in your life. Your a real angel to share your emotions with the world of how you truly felt and you showed me that maybe I can do the same. That truly was a lovely story,I am so proud to say that we are related. Great Accomplishment. It is perplexing that you would write a “feel good” story after you abandoned a dog due to your failure to train it properly and give it the level of exercise it needed. You are right- only a scumbag WOULD abandon their dog to a shelter, after you were either too lazy ,negligent or ignorant to train it. I deeply wish that people like you would stop “getting” dogs. The golden retriever worked out because she was low energy and already trained, or “well mannered” as you put it. You did not have to roll up your sleeves. and get to work. And, you write a sentimental story about, with the unspoken idea that you are somehow redeemed, and even quote scripture. If the golden retriever developed health problems that are costly, or changes dispositions, or in anyway becomes a burden- will she to be dumped? Please understand- you are not a dog lover. Dog lovers do not dump dogs at shelter (and was it really the SPCA?) because they have to invest time and energy in properly training a dog. Many people have hardships, and they still take the time to love and care for their dogs.